Skyrim is one of the nine provinces that you can visit in Arena and the starting locations for Nord characters. 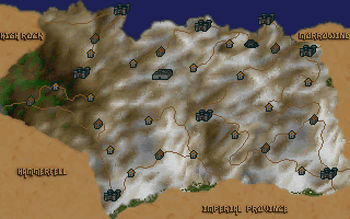 It is a snow-covered region, with icy glaciers and northern winds, in the north of Tamriel. It borders Morrowind to the east, the Imperial Province to the south, Hammerfell to the southwest, and High Rock to the west. During the Main Quest, you will travel to the Fortress of Ice, as well as locate the second piece of the Staff of Chaos in Labyrinthian. Dawnstar — A city-state located on the northern coast of Skyrim. Falcrenth — A city-state located in the southwestern corner of Skyrim, near the border of Hammerfell. Riften — A city-state located in the southeastern corner of Skyrim, near the border of Morrowind. Snowhawk — A city-state located in western Skyrim. Solitude — A city-state on the northwestern coast of Skyrim, north of Snowhawk. Whiterun — A city-state located in central Skyrim. Windhelm — A city-state located in eastern Skyrim, near the border of Morrowind. Winterhold — A city-state located on the northeastern coast of Skyrim. Amol — A town in northeastern Skyrim, south of Winterhold and west of Windhelm. Dragon Bridge — A town located in northwestern Skyrim, southwest of Solitude and north of Snowhawk. Granitehall — A town located in southwestern Skyrim, south of Snowhawk and north of Falcrenth. Karthwasten Hall — A town located in western Skyrim, southwest of Snowhawk. Oakwood — A town located in southern Skyrim, northeast of Falcrenth and southwest of Whiterun. Stonehills — A town located in central Skyrim, southeast of Solitude and southwest of Dawnstar. Sunguard — A town located in southeastern Skyrim, east of Whiterun and west of Riften. Vernim Wood — A town in eastern Skyrim, south of Windhelm and north of Riften. Amber Guard — A village located in western Skyrim, southwest of Snowhawk. Black Moor — A village in central Skyrim, west of Whiterun. Dragon Wood — A village located in northeastern Skyrim, south of Windhelm. Dunpar Wall — A village in the province of Skyrim, south of Dawnstar. Dunstad Grove — A village located in northwestern Skyrim, east of Snowhawk. Helarchen Creek — A village in the province of Skyrim, southeast of Dawnstar. Greenwall — A village in southeastern Skyrim, west of Riften. Lainalten — A village located in western Skyrim, south of Snowhawk. Laintar Dale — A village in the province of Skyrim, just northeast of Whiterun. Markarth Side — A village located in western Skyrim, north of Snowhawk and southwest of Solitude. Neugrad Watch — A village in southwestern Skyrim, northeast of Falcrenth. Nimalten City — A village located in east-central Skyrim, southeast of Whiterun. North Keep — A village located in southwestern Skyrim, north of Falcrenth. Pargran Village — A village located in eastern Skyrim, roughly equidistant to Whiterun, Windhelm, and Riften. Reich Corigate — A village located in Skyrim. Riverwood — A town located in southern Skyrim, south of Whiterun. This page was last modified on 10 February 2019, at 23:54.